This month the focus is on radishes, a woefully under-appreciated gem. Best while small, from planting to picking they take about a month, which means they’re a great crop for supremely impatient people. They’re even low-waste, as their tops can be used too, by sautéing or blitzing into pesto. Most importantly, though, is their flavour – although peppery while crisply raw, when roasted their heat mellows, and they’re glorious on their own with just butter and a little salt. Intrigued? Maybe try them with dairy, in a smørbrød with goat’s cheese, radish and rosehips, or with burrata. The humble radish can also jazz up other veg of the season, such as in this roasted radish and asparagus tart, and even take a role in dessert, like this cinnamon ice cream with maple roasted radishes. Throughout May, we can expect to find: asparagus; cucumber; cauliflower; lettuce (curly); spinach; apples (bramley, braeburn, gala, kanzi, and jazz); pears (conference); and field-grown rhubarb. 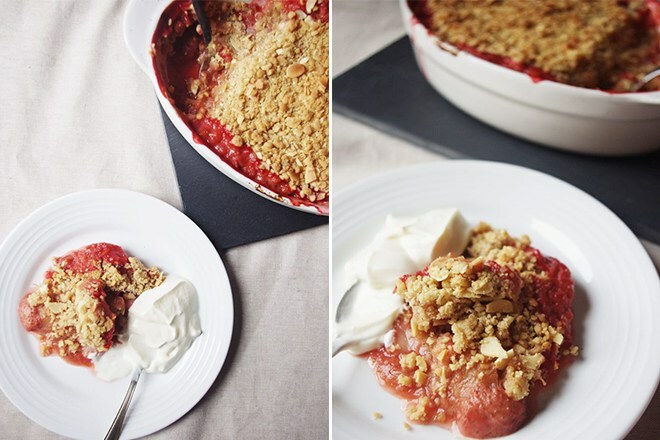 Strawberries have also come in already, and come together beautifully with rhubarb and almond in this crumble. We’ll start with the make-or-break bit: the topping. Put the flour, sugars, and butter into a large bowl and rub together until fully combined, with part crumbs and part balls of dough. Add the oats, almonds, and cinnamon and stir together with a spoon. Set aside, and turn the oven to 180C. Over a medium heat, cook the rhubarb with the marmalade until the rhubarb has just started to soften (you may need to add a little water, up to a tablespoon). Add the strawberries and the sugar, give it a quick stir to bring it together and remove from the heat. You may wish to add to a little more sugar to your taste. Transfer the fruit to your dish of choice, roughly smooth the top out, then evenly spread the topping over until you can’t fit any more on. Eat any leftover topping with a spoon. Bake on the middle shelf for about 20-25 minutes, or until the fruit is bubbling, maybe a little over the side, and the crumble is a deep golden brown. Serve with ice cream, custard, or maybe creme fraiche, as you prefer!